Kevin Z. hails from Punxsutawney, PA (yes, the home of the groundhog), but is now living in Peru. He graduated from Clarion University of Pennsylvania with a degree in broadcasting. While in college, he was the sports director at the universities radio station, and the voice of Clarion Golden Eagles Basketball. After college, Kevin worked for another station in Clarion and was the morning show host at a station in Punxsutawney. He is a fan of the Dallas Cowboys (America’s Team) and loves Dirt Track Racing. It is way too flat in Illinois, but he is enjoying the Central Time Zone. 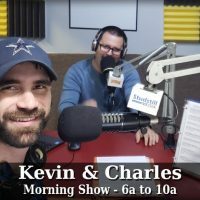 Growing up in Earlville amongst the corn fields, Charles finds himself home during The WGLC Morning Show with Kevin Z. In his spare time, he works on a collection of old Chryslers from the 1960’s that may or may not be on the road at any given time. Charles currently resides in Mendota with his wife and daughters. Kevin & Charles take you through the morning with Kevin and Charles in the Morning from 6 until 10 a.m.